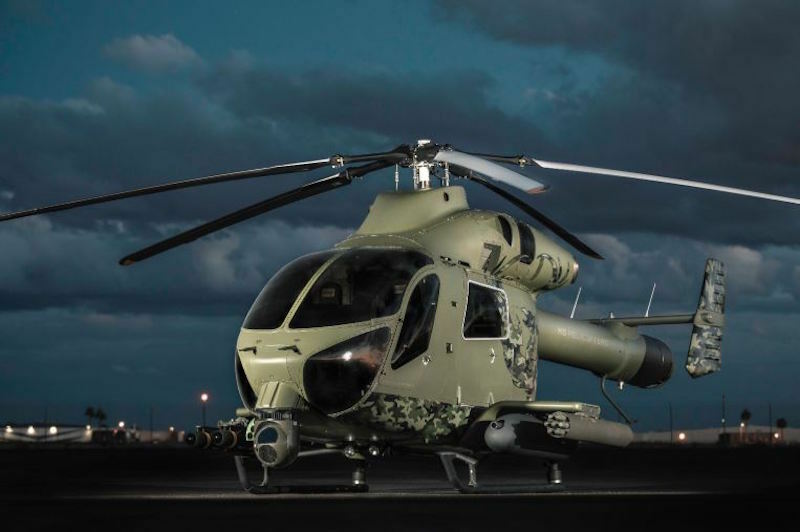 MESA, Ariz --- MD Helicopters, Inc. (MDHI) is proud to debut the MD 969 Combat Attack Helicopter at HAI Heli-Expo 2019. The MD 969 represents the next evolution of MDHI’s iconic MD 900/902 series helicopters. Displayed at the MDHI booth, C1228, in a weaponized configuration the MD 969 Combat Helicopter represents the future assault and attack capabilities of this proven and powerful light twin-engine aircraft. The Genesys Aerosystems Advanced IDU-680 integrated all-glass cockpit is a highly capable and customizable next generation glass cockpit solution that is also the avionics system of choice for MD Helicopters’ MD 530G Attack Helicopters. Rugged, high definition construction engineered to meet DO-160 environmental and MIL-standards for contrast, sunlight readability, anti-reflective glass and NVIS Radiance. The Genesys systems delivers on-demand access to Automatic or Manual Revisionary Modes, 3D Synthetic Vision, Geo-Referenced Hover Vector, Night Vision A&B Capabilities, Weather Radar Integration, Integrated ADS-B Traffic Display, Engine Instrument Crew Advisory System (EICAS), Flight Data Recording, Graphical FMS/VHF Navigation, an internal radio, and moving maps. In addition to advanced avionics, the MD 969 Combat Helicopter also features a proprietary, MDHI-designed integrated composite weapons plank that allows for greater operational flexibility and expanded mission capabilities. The integrated plank allows for up to 6-station, fixed-forward weapons installation while maintaining unimpeded, full-cabin access to support simultaneous forward fire, crew-served weapons, and personnel transport missions. The up-to-8-seat MD 969 Combat Helicopter is single-pilot IFR certified, and safely and effectively executes a broad range of military, para-military and utility missions including Fast Attack, Combat Search & Rescue, CASEVAC/MEDEVAC, Command & Control, and Personnel Transport. -- HIGE – 10,650 ft.
-- HOGE – 8,870 ft.
“As we continue to develop the MD 969 for our military customers, and prepare for development of future attack and reconnaissance aircraft, we have a roadmap that significantly expands the performance envelop for the MD 969, creating a foundation for other future twin-engine development efforts,” Tilton concluded. MD Helicopters anticipates Type Certification for the Genesys Aerosystems glass cockpit by the end of Q4 2019.